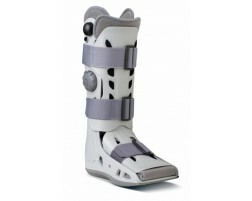 Medical walking boots are used to protect the foot and ankle after an injury or surgery. They are commonly used for stress fractures, shin splints, broken foot or ankle bones, and severe ankle sprains. Medical walking boots aid in the beginning of the rehabilitation process by stabilizing and protecting the area while it heals. As the foot or leg begins to heal, a walking brace slowly allows weight to be put onto the injured foot as the person transitions towards a full recovery. 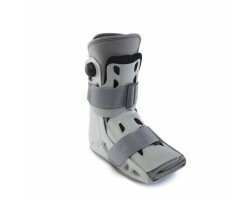 Your doctor may recommend a walking cast also known as an orthopedic walking boot instead of a full cast that will immobilize you. Shop top walking boot brands: Aircast, Procare, and DonJoy. How do Walking Boots Work? A walking boot is comprised of a hard outer shell which supports the full leg and foot while protecting it from accidental bumping or kicking of furniture and from any objects that may fall on the foot. The inside of a walking boot often uses pneumatic compression to help with circulation and is cushioned for comfort and helps disperse shock. 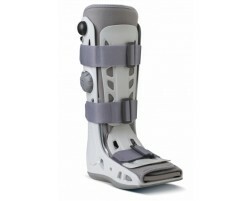 The bottom of the boot often comes with a rocker bottom to help with walking normally.